There are passion projects, and then there’s Deadpool. As we all know, Ryan Reynolds had been clamouring for nearly a decade to bring his most cherished Marvel character to the big screen, following a now-notoriously disastrous attempt to introduce the character in X-Men Origins: Wolverine, but even he probably couldn’t have predicted how hugely his obsession would have paid off. The anti-hero’s first on-screen movie not only won over both critics and audiences for its zany, foul-mouthed and extraordinarily meta sense of humour (among other things), but it broke several box office records and went on to out-gross several other Marvel properties, including every other X-Men movie before it and, so far, since. A sequel was inevitable, as it is for many high-grossing superhero movies like this, but having proven himself with the first film, the pressure on Reynolds to deliver a satisfying follow-up must have been even greater this time. Get it right, and the world would be his oyster; get it wrong, and he would have been labelled as a modern-day Icarus, who flew way too close to the sun. The end result, thankfully, is largely not the latter, making Deadpool 2 one of those rare comedy sequels that actually works, not to mention an extremely entertaining and solid enough follow-up that will have fans of the first movie mostly satisfied. 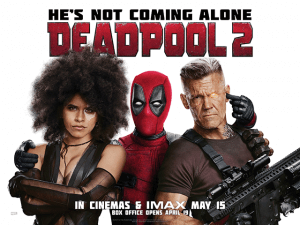 Picking up some time after the events of the first film, Wade Wilson (Reynolds) – the red-suited assassin known as Deadpool who has regenerative powers – is living a pretty solid life, killing bad guys all over the world and bunking up with the love of his life, Vanessa (Morena Baccarin). However, when tragedy strikes, he finds himself in a depressive state that only begins to heal itself when he encounters young Russell (Julian Dennison, aka the kid from Hunt for the Wilderpeople), an angst-ridden adolescent with the power to set things on fire. But even that is threatened when Cable (Josh Brolin, riding a Marvel high right now following his turn as Thanos in Avengers: Infinity War), a cyborg mutant from the future, travels back in time to specifically kill Russell, which forces Deadpool into action by setting up a team of mutants to take on the futuristic threat. Among the new recruits for the team he labels X-Force is Domino (Zazie Beetz), a mutant with the power to manipulate luck, and together they all set out to save Russell from his fate – unless, of course, fate has other plans. Deadpool 2 is one of those sequels that definitely attempts to go bigger, and even tries fixing a common complaint about the first film’s simplistic and formulaic plot, but it manages to be a strength and slight weakness for the film. In terms of its comedy, there’s no question that things have stepped up to a new level with this character and the world he inhabits, with fourth-wall breaking and meta references unlike any others you’ve seen before, even for Deadpool, and one-liners that land on their feet far more than ones that splat face-first on the ground. There are things about it that anyone, from fans of the first film to any newcomers, can laugh at and have a good time with, and so much of that is down to how Reynolds – who is also credited as a co-writer on the film alongside Rhett Reese and Paul Wernick – is both a naturally gifted comedic actor, and also a complete and utter savant when it comes to quippy dialogue and his irreverent, sometimes bizarre, sense of humour. You can tell that he is on top of the world playing this role, and he easily carries this film on his incredibly aware shoulders, matched in on-screen charisma and dry humour by franchise newcomer Zazie Beetz, whose casting as Domino is perfect if you’ve ever seen her on Donald Glover’s show Atlanta, and who gets some of the film’s most memorable scenes and moments that really make you want to see and know more about this character, especially with Beetz playing her. As fun and exhilarating as this movie can be, however, there are parts of it that leave you feeling so exhausted and with a desire to just step back for a few minutes to recuperate, which the movie rarely allows to its minor detriment. Though the action, directed by Atomic Blonde director and uncredited John Wick co-director David Leitch, is for the most part enjoyable, some of the editing and blatant CGI leave a lot to be desired, and it does all come at you in one go without much of a chance to let you take it all in, meaning that at least one more viewing of it to pick up on some of the gags and background stuff you may have missed the first time round is required. Even a very small amount of the jokes don’t land as well as the majority of the others, including one near the end which really outstays its welcome by going on for far too long to a point where the joke is no longer amusing. In many regards, Deadpool 2 is very much a “bigger and bolder” sequel, which for the most part does work, but there are other parts that really do hold it back from being truly fantastic. I’d say it’s just barely on par with the first film, because it is a very funny movie with some inspired sight gags and meta references that had me laughing out loud on more than one occasion (including a mid-credits sequence that’s worth the ticket price alone), though it contains one or two major flaws that prevented me from really enjoying it like I did the first time around. Deadpool 2 contains more of the zany, foul-mouthed and largely hilarious comedy you enjoyed about the first one, brought on by Ryan Reynolds’ utter commitment to the part, though its bigger and bolder attitude tends to get in its way at times, leaving you exhausted but mostly entertained by its complete irreverence and wildly contagious sense of humour.